November 17, 2018 – Springfield parking ban ended as of 7:00 AM. The City of Springfield parking ban ended as of 7:00 a.m. Saturday, November 17th. We thank you very much for your assistance and cooperation with this matter. Please be advised that on August 24,25, and 26, parking for all Springfield Parking Authority facilities will be charged at regular on-the-clock rates, with the exceptions of Special Event rates of $15 for parking at the Dwight Street lot available during that time. 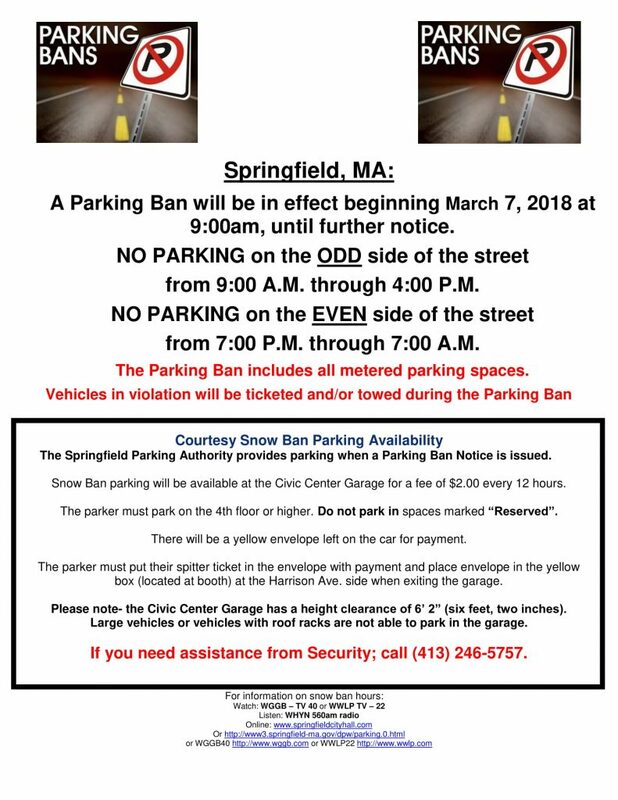 The following rules, regulations and fines with respect to the use of all parking facilities owned or operated by the Springfield Parking Authority (hereinafter the “Authority”), are hereby adopted to be effective on the date above. In addition to the fines stated in the following rules, any vehicle which is found to be in violation of any rules may be towed and stored at the owner’s expense. Neither the garage operator, nor the Springfield Parking Authority, nor any entity participating in any removal shall have any liability to any person for any loss or damage on account of such removal. All costs accrued in such removal accrue to the owner. At the election of the Authority, the fines stated below shall be imposed on the registered owner of the vehicle found to be in violation of the rule or on the person committing the violation. The word “parking” in these rules shall refer to vehicles whether they are occupied or unoccupied and whether or not their motors are running.  No vehicles shall be parked except totally within the lines of marked parking spaces so that no more than one space is used by a single vehicle, and no part of the vehicle projects into abutting aisle or space.  No vehicles shall be parked so as to block or obstruct any driveway.  Except upon entering a parking space, no vehicle shall be parked at a meter where the overtime signal is displayed.  No monthly parkers shall park their vehicles in areas where monthly parking is posted as being prohibited.  No transient parkers shall park their vehicles in areas posted for monthly parkers alone.  No vehicle shall be parked in a facility that is closed to the public.  Vehicles shall not be parked for more than the posted time in a loading zone.  The operator of any vehicle which causes injury or death to any person or damage to the property of the Authority or other persons shall report such incident immediately to the representative of the Authority in the facility or, if there is no representative in the facility, shall immediately notify by telephone the Springfield Parking Authority office and shall file with the Authority such accident report forms as it may require, with 48 hours of the incident.  No person shall operate a vehicle in a facility at a rate of speed which is unreasonable for the conditions existing at the time, and in no event, at a rate of speed which exceeds the posted speed limit of five (5) miles per hour.  No person shall drop, throw, place or caused to be dropped, any litter, trash, garbage, refuse or other debris in or from any parking facility.  No vehicle shall be parked in areas marked “No Parking” or in areas which are painted in cross hatches.  No vehicle shall be parked in a space marked “Reserved” unless the operator of the vehicle has leased that specific parking space.  No vehicles shall be parked so as to block other vehicles or otherwise prevent other vehicles from being removed from a parking facility or so as to impede access to any elevators, stairs or pedestrian walkways.  The facility shall be used only for the parking of motor vehicles and no commercial, business, professional or social activities shall be conducted in any facility except with the prior written approval of the Authority.  No person shall remove a vehicle from a facility without paying the proper charges for parking therein.  No vehicles shall be parked in posted Handicapped Parking spaces except vehicles bearing official Handicapped license plates issued by the Massachusetts Registry of Motor Vehicles, or other appropriate identification.  No person shall injure, deface, paint, write on, put graffiti on, destroy, remove or carry of any sign, tree, shrub, equipment or other property in a parking facility or the structure of the parking facility.  No vehicle shall be parked in a pay and display facility when the time on the parking ticket has expired.  No person shall park their vehicles in any facility without proper notification to the Authority. Only vehicles with registration information provided on a current Springfield Parking Authority Monthly Parking Agreement will be considered authorized as a monthly parker. Any unauthorized vehicle found parked in any facility will be towed at owner’s expense.  No person shall operate a vehicle in a facility against the posted travel direction or any other posted directions for that facility.  No vehicles shall be parked in any facility without having current registration and displaying current license plates issued by the Massachusetts Registry of Motor Vehicles or other appropriate identification. Any unregistered vehicle found parked in any facility will be towed at owner’s expense.  No vehicle that is in unsafe condition or is otherwise incapable of being operated in the manner for which it was designed shall be parked in any facility. This includes, but is not limited to, flat tires, broken windows, leaking fluids or without current registration issued by the Massachusetts Registry of Motor Vehicles or other appropriate identification. The parking garage may not be used for vehicle storage or repair. Any vehicle or equipment remaining in the garage for more than 5 continuous days may be deemed abandoned and be towed at owner’s expense. The garage operator will endeavor to, but is not required to, contact the owner by mail, telephone or other means prior to removal.  No vehicle shall be parked in a space marked for reserved parking which is not expressly authorized by the Authority to park in that space.  No person shall allow a vehicle to be parked overtime, beyond the period of legal parking time established for any parking meter or to deposit in any parking meter any coin for the purpose of parking beyond the maximum legal parking time for the particular parking meter. The City of Springfield parking ban will end as of 7:00 p.m., today, March 13th. We thank you very much for your assistance and cooperation with this matter.